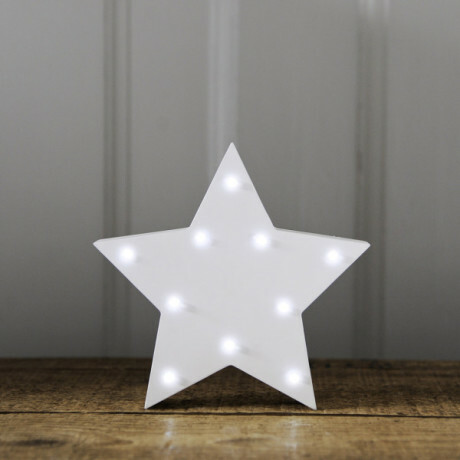 Create some Christmas cheer around the home with the fun White Wooden Star light. The light is battery operated making it easy to brighten up any event. Made from sturdy MDF it has a classy matt white finish and has ten LED lights. When switched on, the white LED lights give a bright eye catching glow which adds a fabulous ambience to any room, as well as at an event or party. Perfect for weddings, parties and in teenager's bedrooms. These fun light products are easy to use as there are no fiddly cables to worry about, and each Star light takes 2 x AAA batteries. They make a great gift idea for teens and students. Please not Batteries are not included.